Above is the cover of Bravo Company’s new, excellent book of class Bios and Reflections. To those who think patriotism is dead in America, my advice is to hang out with a group of Vietnam War veterans. Not long ago, I had the opportunity of practicing what I preach. It was refreshing to be among a special gathering of Marine officers, who some would say have every right to question love of country, having served in a very unpopular war. Instead, reflecting on their Marine Corps commitment that officially began in Basic School, five decades earlier, most attribute their TBS experience as giving them an appreciation of service to country, pride of being a Marine and gratitude for the opportunities they received in return. In September, 2016, I received a call from an old friend, Mike Wholley, BGen, USMC (Ret), inviting me to attend the 50th Anniversary Reunion of The Basic School, Class of 1-67, Company B, of which Mike and my first husband, Capt Jerry Zimmer, were members and served in the same platoon – Bravo Company, 4th Platoon, to be exact. Of course, I’d like to brag that the 4th was the best, but to be honest, platoon selection was/is based strictly on the alphabet – hence Wholley and Zimmer along with approximately 25 others were last, but not least, of 2nd Lieutenants assigned a platoon in B Company. The notion that all kids in the 1960s were part of the hippie counter culture movement was not accurate, nor did it apply to the path taken by 185 Bravo Company Marines. These Marines heeded the call to serve, with nearly half of the class having earned coveted NROTC scholarships to Ivy League Schools and other top-rated institutions that might otherwise have been financially out-of-reach. 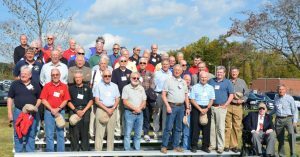 Bravo Company’s 50th Anniversary Reunion drew a record number of members from all points. I was curious, as a writer and Jerry’s former wife, to learn more about the Marines of B Company. 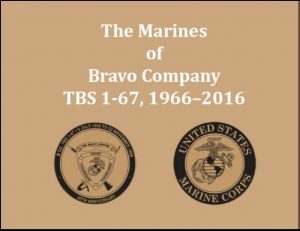 Thanks to the efforts of Andy Vaart, Capt, USNR (Ret); Bob Lange, Col, USMC (Ret); and Phil Norton, Capt, USMC (Ret), a collection of bios was received from most members of B Company, and Andy subsequently sent me a PDF of the soon-to-be published book, entitled “The Marines of Bravo Company, TBS, 1-67, 1966-2016.” The book will be a wonderful keepsake of the 50th Anniversary for guys who served in B Company. Undoubtedly the book will also find its way around the Marine Corps veterans’ circuit — and like the guys of Bravo Company, many will relate to the realization of when Basic School ended and training in an MOS began, a lot of the them never knew what route their Marine brothers took, especially career-wise, and I guarantee that is what makes “The Marines of Bravo Company….” a great read.